E.C. Kidd, a west coast tattooist is best known for his years in San Francisco. 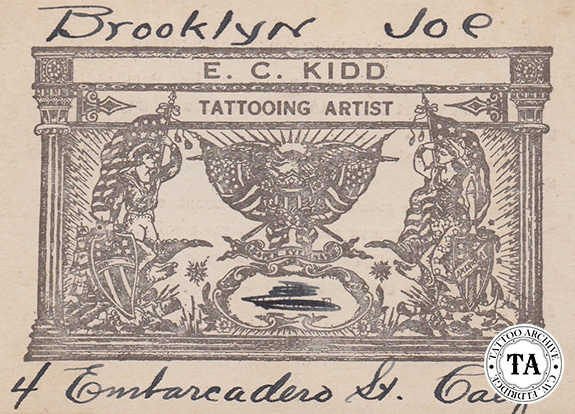 Kidd worked on the Embarcadero at #4 and #26 with Brooklyn Joe Lieber and C.J. Eddy. 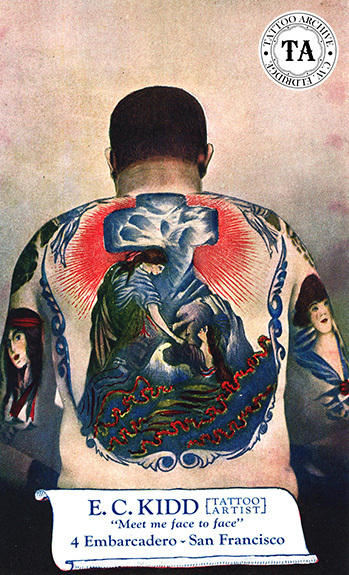 These tattoo locations were as close to the San Francisco Bay as any in the city's history. It was also very near to the Ferry Building, the hub of transportation in San Francisco. The Ferry Building that stands today was built in 1898 and was the terminal for trains, ferry boats and trolley cars around the turn of the century. Because of the number of people moving through this part of town it was a prime location for a tattoo shop. 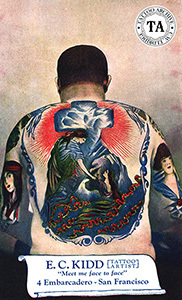 In the 1940's Kidd produced a color postcard showing his great Joe Lieber's Rock of Ages back piece. 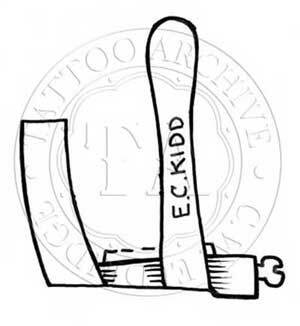 At this time Kidd was tattooing at #4 Embarcadero and the by-line on the card said, "Meet me face to face." Ironically to date we have never seen a photograph of E.C. Kidd's face.